How badly can one series start?? This is the question that plagued me all through this DVD. In answer to this question; I have to say that I have never seen a lamer start to a series. Ever. It got so bad; I had to turn off the English voices to get some respite from the clich�d twaddle assailing my ears. reflective light moves up and down a persons head relative to their position to the light source, and that the whole head will NOT reflect that light. Especially the part that's in the shade?.. Then we have the issue of the noses. There seems to be a proliferation of turned up noses that I expect at any moment to grow into Pinocchio like proportions. More questions then started jumping into my head. Like; "Escaflowne?!?" The only reason this review is going any further at all is that once you get to the third episode, there is a rapid change for the better. The lamer clich�s disappear, a plot kicks in, and suddenly the bright light of potential spreads over the series. I would love to be able to advise you to skip the first two episode and go straight to the good stuff, but it just wouldn't be the same. There is in fact pertinent information in the first two episodes so you will have to pay attention. 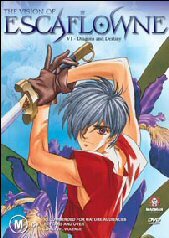 Escaflowne deals with a young girl named Hitomi who has the gift of foresight and the knack of tarot. She is running on her high school track one night when a massive beam of light transports "Prince Van" to earth. Van is from a planet called Gaea, and he has no idea how this happened. Once he slays the land dragon that follows him, he retrieves a dragon stone embedded inside it, and the stone mysteriously interacts with Hitomi's pendant, sending them both to Gaea. The prince returns victorious to his home city and is crowned as Prince of Fanalia. They are then attacked by big invisibility cloaked mechs and Vanalia is destroyed. A large beam of light relocates them to another part of Gaea, and they meet and fight with the chivalrous (and ludicrously dressed) Allen. His realm is then destroyed by the cloaked mechs and an escape scene ensues. If it wasn't for the last two episodes, I would have proudly dished out my first ever 2/10, but the last two episodes bring this DVD up to scratch. So if you have the time and patience, this eventually becomes interesting DVD, and despite my better judgment, I find myself waiting for the second series. 4:3 frame ratio. If you haven't been reading this review, ill make it easy for you, The animation is very average. It is also a little washed out. Vibrant colors may have saved it, but alas it was not meant to be. The English subtitles are close to the dubbed version, which is always a positive. However in some parts the dubbing doesn't quite match the movements of the characters mouths. The sound effects are predictable, and the music is atrocious. Great looking cover shot that in no way resembles anything in the feature. -Music Videos: only people with no sense of hearing or those that loved glam rock would even bother with this. Really quite embarrassing. -Madman propaganda- best part of the extras.